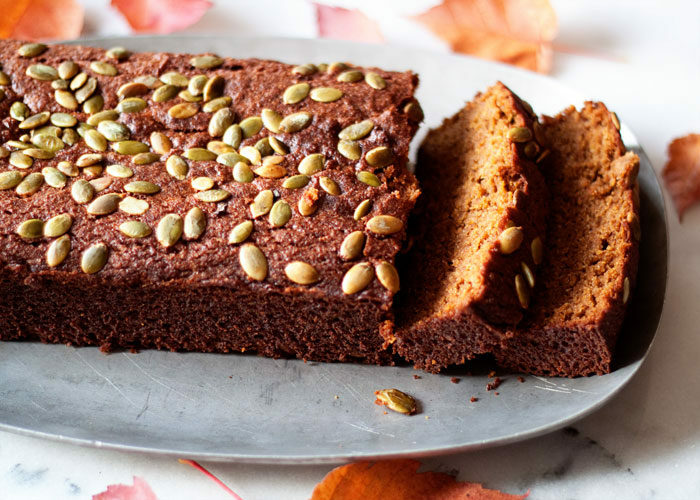 Moist, tender, and full of flavor, this pumpkin bread is scrumptious for everyone – and just happens to be both gluten-free and dairy-free. The Peanuts Movie comes out on November 6, and I’m pretty stoked. I grew up on Charlie Brown, Snoopy, and the gang – and we’re pretty sure this is the movie we’ve selected for our daughter’s very first movie on the big screen. So this movie release is a Big Deal. Capitalized. What else is a Big Deal? 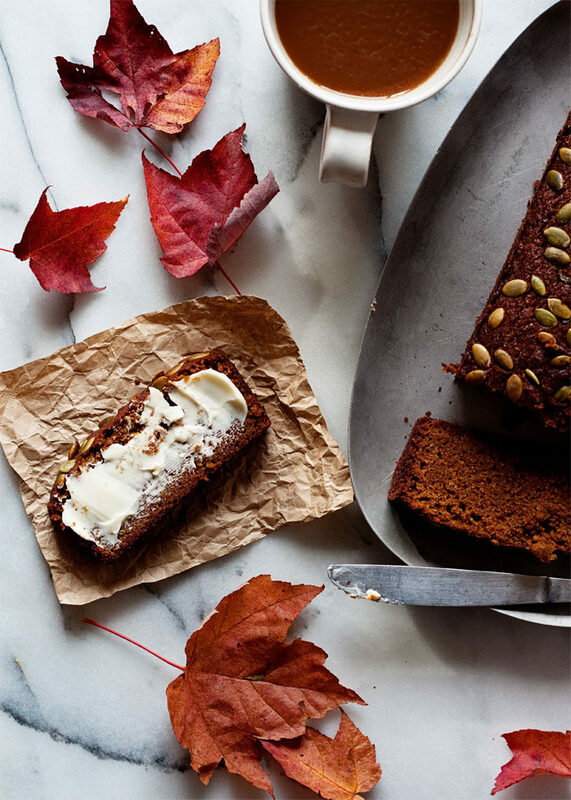 This pumpkin bread! It’s so great, I decided to call it “Great Pumpkin Bread.” Okay, I also called it Great Pumpkin Bread because, hello, The Great Pumpkin! I figured a (great) pumpkin-themed recipe would be the perfect way to celebrate the upcoming release of The Peanuts Movie. 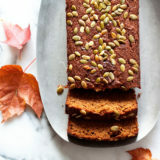 Safeway/Albertsons is the official grocery partner for the movie, today I’ve partnered with them to bring you this pumpkin bread recipe. The best part? 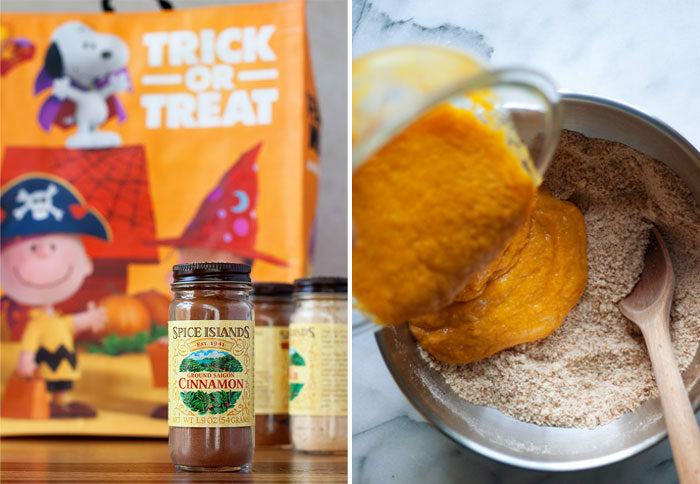 For a very limited time, you can can score a super-cute reusable grocery bag when you shop at Safeway/Albertsons to buy your Great Pumpkin Bread ingredients! We got our bag for free with our purchase of three bottles of Spice Islands spices (though we only need two for this recipe, but I also need some ginger for another recipe, so it worked out perfectly). 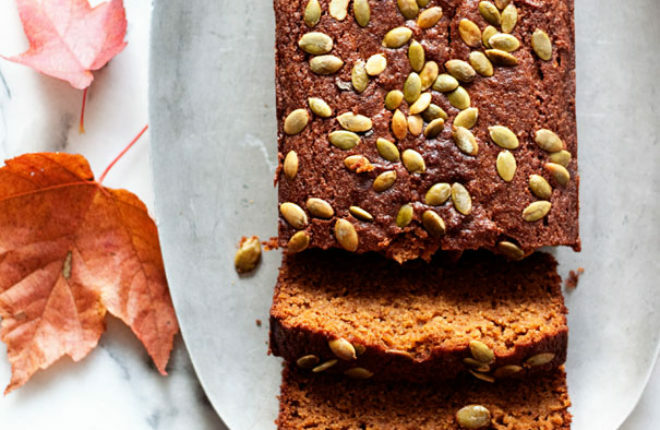 Okay, so first of all, what makes this pumpkin bread so great? It’s utterly moist. Full of flavor. Fairly decadent. Quite possibly toeing the line between cake and quick bread, in the most perfect way. Everybody who’s tried this loves it. 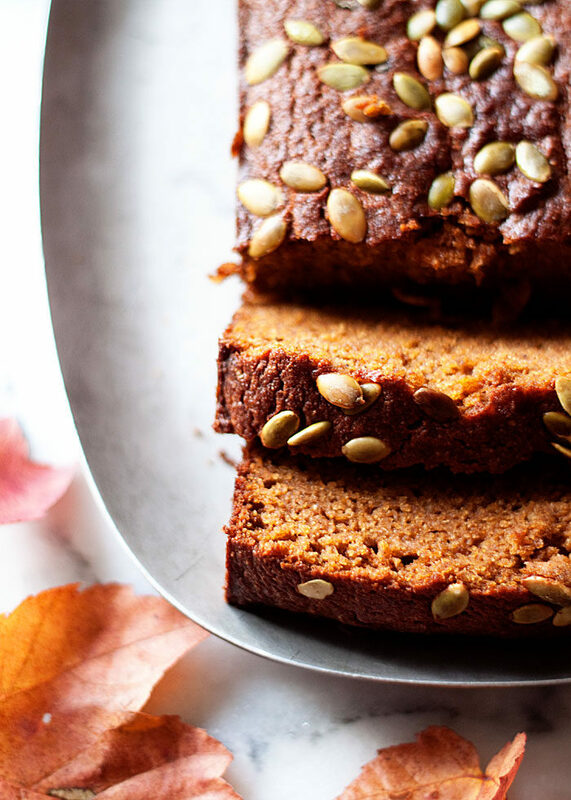 And they never know (or care) what it’s not: this pumpkin bread recipe is both gluten-free and dairy-free. It’s really true – you would honestly never know it is either one of those. All everyone tastes is delicious. Such a win. 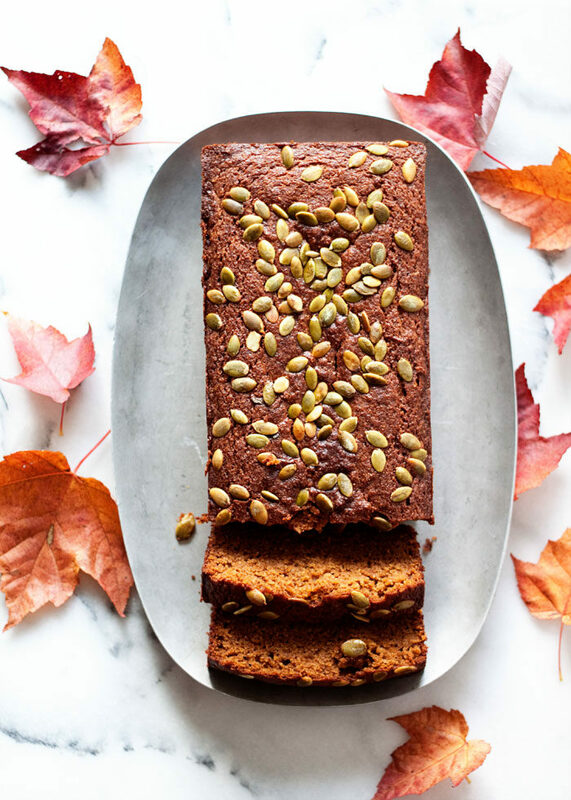 This is a gluten-free pumpkin bread that’s not spongy or tough, and it’s due to the combination of flours – almond flour and brown rice flour. I started with my pumpkin bread recipe as the base, but for the flours, I was inspired by this recipe from Julia over at The Roasted Root, who uses an equal combination of the two flours for her version. The combination of almond and brown rice flours gives this bread such a moist, tender quality. So so irresistably good. Remember how I mentioned that my guy is totally sick of pumpkin? I take it back, because he couldn’t get enough of this pumpkin bread! Friends and family, neither gluten-free or dairy-free, love it too. How great is it when you happen upon a recipe that’s as good (or better) than one with classic ingredients, but it also works for those with certain dietary restrictions? Makes me so, so happy. These adorable bags – there are two designs to choose from – are available in stores for a super-limited time. Buy three items from the following brands, pick up your bag from the front of the store, and when you check out, you’re good to go! Enter the sweepstakes for a chance to win a trip to Snoopy’s home in California and more! Preheat oven to 350 degrees Fahrenheit. Grease a 9-inch by 5-inch loaf pan with coconut oil or an oil mister and set aside. In a large bowl, whisk together the brown rice flour, almond flour, brown sugar, coconut sugar, baking soda, baking powder, cinnamon, cloves, and salt. In a medium bowl, whisk together the coconut oil, pumpkin, and eggs. Pour the wet ingredients into the dry ingredients and mix with a wooden spoon or spatula until well-incorporated. The batter will be very thick. Spread the batter evenly in the pan. Sprinkle the pepitas over the top if using. Bake until golden brown, the bread lifts away from the edges of the pan a bit, and toothpick inserted into the center comes out clean, 35-44 minutes (you may need to allow for a little more time if using butter). Let cool in the pan on a wire rack for about 10 minutes, then remove from pan and let cool completely on a wire rack. To store, wrap tightly with plastic wrap or foil and keep at room temperature. Keeps well for 3-4 days. Sub melted butter for the coconut oil.